If you're looking for a source of advice on Hyper-V troubleshooting, Windows storage, virtualization or PowerShell, then you should check out Didier Van Hoye's Twitter account @WorkingHardInIT. With at least a tweet each day, Van Hoye gives his 4,235 followers a little bit of everything Microsoft-related: advice, humor and workarounds. "He's really up on the latest for storage as far as SMB Direct is concerned -- hosting virtual drives and virtual storage on NAS appliances," said Eric Beehler, co-owner of Consortio Services and a TechTarget contributor. And he's not just sharing his insights on Twitter. 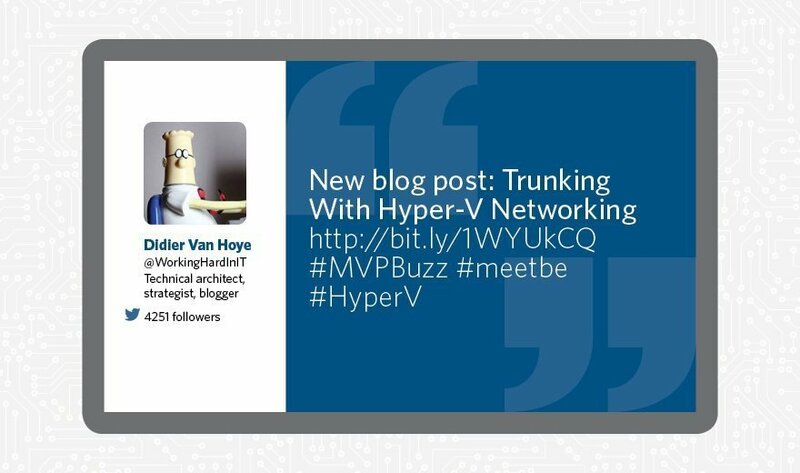 His blog digs even deeper into topics such as Hyper-V troubleshooting, Windows performance monitoring tools, storage and backup. The blog also lists industry events throughout Europe and explains why a Windows admin should care about them. Van Hoye is also a self-proclaimed 10, 40 and 100 Gbps addict -- with a home lab that would be the envy of many IT pros. "For his home lab, it sounds like he's set up where some aren't yet," said Beehler. "A lot of people are asking questions about [10 Gbps] as well as how to run their storage over Ethernet. It's easy to go back and forth with him." Van Hoye is a technical architect and strategist in Hyper-V, Azure, Active Directory, networking and storage technologies. He holds numerous certifications from Microsoft, including Hyper-V MVP and a Microsoft Extend Experts Team member in Belgium. He's also a Dell TechCenter Rockstar and a Veeam Vanguard.